Writing a dual-incoming post is a great way to start the week, don't you agree? 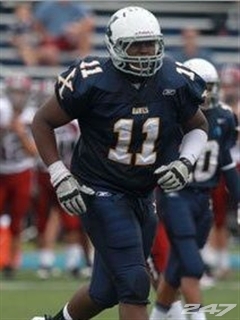 Michigan added two defensive tackle prospects to the class of 2013 over the last few days. Maurice Hurst Jr. committed to Michigan on Friday, and then Henry Poggi committed late Sunday/early Monday. DT was clearly an area of need in this class before these two commitments. Not so much now. To keep all 20 members of the 2013 class straight, here's the recruiting board for your reference. Well, the gurus are in agreement that Hurst is definitely a defensive tackle. 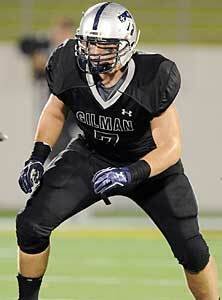 Hurst hails from Westwood, MA and sits at roughly 6-2, 290 pounds. He visited Michigan late last week and committed on the spot...which was not much of a surprise given how high he regarded Michigan throughout the wooing process. Hurst is son of former NFL cornerback Maurice Hurst, who played for the New England Patriots. His cousin, some guy named Marshall Faulk, played a little bit of ball in the league as well – you might have heard of him. Hurst is hovering that gray area between three and four stars according to the gurus. He could probably go either way, and sometimes its something as easy as having other four-star guys drop in the ratings for a guy like Hurst to slide up. He plays primarily DT, but is also quick and nimble enough to carry the ball on offense, which he does regularly. That could be out of necessity, who knows, but a kid that's 6-2 around 290 pounds would not be fun to tackle. Scouts like his ability though and see a lot of potential. He's currently invited to participate in the Army All-American Game. Michigan's second commitment of the last few days is another defensive tackle. Henry Poggi hails from Baltimore, MD and is listed around 6-4, 260. He narrowed his school choices to Michigan and Alabama before eventually committing to the Wolverines today. Nice to beat out the defending national champs for a huge prospect like this. Whatever Hoke and his staff are doing out on the recruiting trail, it's working. Rival's Tom Lemming, the most bullish on Poggi, lists him as the #52 prospect in the country and the #2 DT [Link]. He is a coach’s son and comes across as a fairly smart player who reads schemes well and can get himself in good positions. He is a physical and high effort player who works to get around the ball. He is a good tackler who tries to drive through the ball carrier and wrap-up… As a pass rusher he comes up-field hard… He also plays tight end and is a physical and tough blocker…Poggi is a tough and smart. Henry's brothers, Sam and Jim are also collegiate footballers on scholarship at Duke and Iowa respectively, and his dad is the head ball coach at his high school. According to MGoAce, his dad says Henry is the best out of the bunch. As DTs go, Henry is slightly smaller than the ideal size. So if he plans on trying to get closer to the interior, he'll need to pack on some size. His 6-4 frame is likely suited for such, and I would expect to see Montgomery ask him to do so. This likely satisfies the DT position for the 2013 class now that we have two verbals. Michigan is expected to take around 23-24 prospects in this class. And with 20 already committed in early June, expect Hoke and company to narrow their focus a bit.